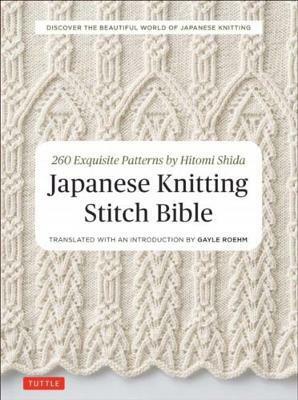 In the Japanese Knitting Stitch Bible knitting guru Hitomi Shida shares some of her favourite needlework patterns. Shida's strikingly original designs and variations on every imaginable classic stitch result in intricate patterns that form the basis for beautiful and unique knitted fashions. This is the perfect book for the experienced knitter who is looking for new stitches that yield spectacular results. The stitches featured include cables, popcorn stitches and edgings. A set of detailed, step-by-step diagrams show you how to execute all the basic stitches. Instructions and diagrams for a series of small projects offer practice working with large patterns, lacy patterns and pattern arrangements. The projects include ever-popular fingerless mittens, a feminine collar and thick socks. Hitomi Shida is a well-known Japanese designer of hundreds of original knitting stitches and knitted garments. She has been teaching, designing and writing books for over 20 years and her work already enjoys a worldwide following among Japanese knitting fans. Gayle Roehm devotes herself to fiber arts and happily spends her days with yarn and needles. She has lived in Japan and studies the language for many years, and has knitted from Japanese patterns for most of her knitting career. Gayle teaches at knitting gatherings around the country, and occasionally publishes her own designs.